Asked if he stood by his earlier statement that the Sena rotted in 25 years of alliance with the BJP, Thackeray said his father extensively travelled across Maharashtra to spread his party. 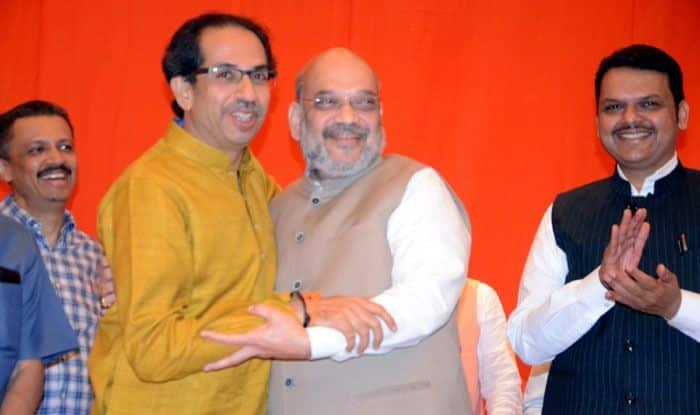 Shiv Sena chief Uddhav Thackeray on Tuesday said his party and the BJP are bound by Hindutva and the two decided to enter into a pre-poll alliance after overcoming differences that soured their ties in the past. In an interview to Sena MP Sanjay Raut in party mouthpiece ‘Saamana’, Thackeray said he agreed to the alliance after BJP president Amit Shah came to him twice to sort out the issues. The Sena, which has often been critical of the BJP, its leadership and policies of the NDA government, entered into a seat-sharing pact with the ruling party recently. The BJP and Sena agreed to contest 25 and 23 seats, respectively, in Maharashtra which has 48 Lok Sabha constituencies. “…You ask me why did we agree to an alliance again. The whole world is a witness. BJP president Amit Shah came to me not once, but twice. And when the alliance was charted out, we put forth the problems of people. Even the chief minister was present when all this happened,” Thackeray said. Shah wanted the sourness between both the parties to end, he said, adding he also agreed to the BJP chief’s views. To another query, Thackeray said in the course of discussions, the issues that caused the sourness between the two saffron parties were “ironed out”. “Like before, Hindutva is the thread that binds the BJP and the Sena together,” he asserted. He also hit out at the opposition parties, saying if they come to power, they would “quarrel” for the prime minister’s post as they lack a leader to bind them together. The way the opposition parties have come together now ahead of the Lok Sabha polls, they had made a similar move after the Emergency — since there was immense anger among people — and formed the Janata government which lasted for 22 months, he noted. “Then they at least had a face in Jayaprakash Narayan. Now, there is no face to bind the opposition in the country. If the opposition comes to power, there will be quarrelling among them for the prime minister’s post,” he claimed. “We (Sena and BJP) have Hindutva as a common thread. Hindutva is nationalism,” said Thackeray, whose party is an ally of the BJP at the Centre and in Maharashtra. To a query on BJP veteran LK Advani, Thackeray said during the last five-ten years of his father late Bal Thackeray’s life, the younger generation took over the Sena and the patriarch guided them, but intervened and spoke only when it was necessary. “Change is a natural process. But it doesn’t mean you forget them after making them retire. You have to be forever grateful to them. Because, the Sena supremo, Atalji, Advaniji sowed the seeds in an extremely difficult environment. They risked their lives in spreading Hindutva,” he said. “However, we became inattentive after the alliance (with BJP). This carelessness is no more there. Spreading of one’s ideology is not a crime,” he said. “Should I keep the Sena limited to the seats which we received as part of the alliance formula? Should we not take our party to other places as well? Because Sena is not a party but an ideology,” the 58-year-old leader said. Asked if he had also become a “chowkidar” after the tie-up with the BJP, Thackeray said he was just a common man. “I am a Shiv Sainik. I don’t need to be separately called a chowkidar. A soldier is a soldier who safeguards the common man and fights for their rights. I don’t need to separately become a chowkidar,” he said. Prime Minister Narendra Modi recently added “chowkidar” to his Twitter handle profile and asked people to take the #MainBhiChowkidar pledge against corruption. Several BJP leaders and ministers later followed suit. Asked if the Sena will get a better share in portfolio allocation after the Lok Sabha polls, Thackeray said maintaining relations was the responsibility of both the alliance partners. But, the first priority was to win the elections and the opposition, however weak, cannot be ignored, he added. On the leadership of Congress president Rahul Gandhi and his sister Priyanka Gandhi Vadra, Thackeray said he does not have personal enmity against anyone. “Since they are both younger to me, I look at them as kids. Both these kids are trying to find stability in the present environment. We will know about their success and failure later. However, I don’t see a specific shape of his (Rahul Gandhi’s) leadership,” he said.